Reference Pricing — Coming soon to a health plan near you? United States (US) health plans are beginning to implement reference pricing as a tool to control the cost of healthcare. Germany implemented reference pricing in 1989 followed by The Netherlands in 1991, New Zealand in 1993 and other European countries. As of 2014, according to a study by Aon Hewitt, in the US, 10% of employers with 500 or more employees implemented reference pricing for one or more procedures. 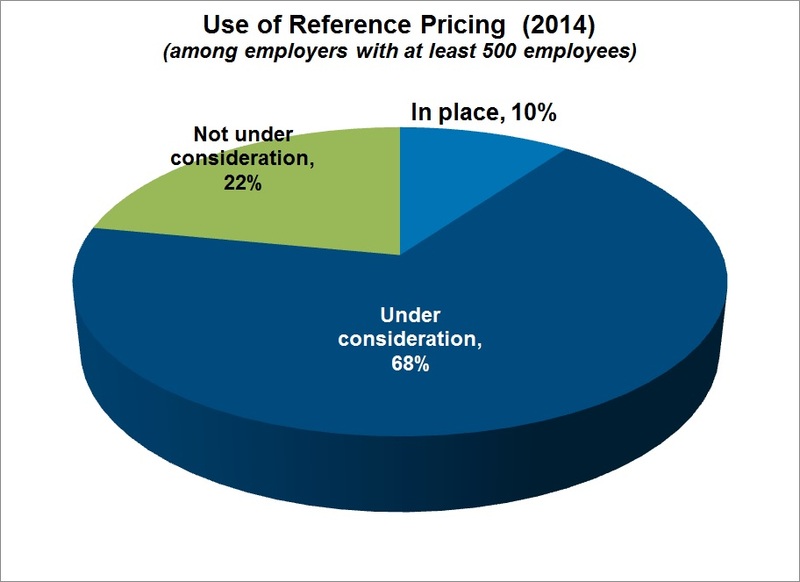 68% of these employers are considering reference pricing. According to another study conducted in 2012 (Reference Pricing for Health Care Services: A New Twist on the Defined Contribution Concept in Employment-Based Health Benefits; By Paul Fronstin, Ph.D., Employee Benefit Research Institute; and M. Christopher Roebuck, Ph.D., RxEconomics), the percent of employers using reference pricing did not change between 2012 and 2014, but the percent of employers considering reference pricing programs grew from 16% to 68%. As with any artificial price control, everyone loves the potential cost savings reference pricing may produce. However, as with any program, there are issues that may affect the cost savings realized or impact the quality of care. What is reference pricing? Simply put, under a reference pricing system, a health insurer determines the maximum amount it is willing to pay for a procedure or a branded drug. For procedures, reference pricing is most appropriate for non-emergency care for which there is relatively little quality variation among providers and in treatment algorithms (e.g., hip and knee replacements; transplants). Reference pricing also can be applied to non-emergency, therapeutically-interchangeable branded drug products. Reference pricing programs are most appropriate for PPO products rather than HMO products. Under today’s defined-benefit healthcare plans, the patient pays either a fixed co-pay, which is set by the health plan, or a variable co-insurance (a percent of the procedure’s or drug’s contracted price). Under a reference pricing system, which is a defined-contribution structure, if a patient selects a provider or a drug that charges more than the reference price, the patient is responsible for the difference in cost. Assuming access to more than one hospital or drug therapy, the patient shops for the provider or drug they want based on access, outcomes and quality of care and chooses the amount he or she wants to contribute to the cost of care. Almost all payers currently use a reference pricing program for generic drugs. Under this program, health plans set a “maximum allowable cost” (i.e., MAC price) when two or more manufacturers offer the same generic chemical entity and they are therapeutically interchangeable. This program has successfully lowered the cost of multi-source generic drugs. The reference price this article discusses is for procedures and branded drugs. Health plans can use reference pricing to develop a provider network within a network. While the ACA sets federal requirements for network design, payers can set a reference price and use only the portion of its network that accepts that price. Health plans’ trends towards narrower networks, even for PPO products, exerts even more pressure on payers to appropriately set reference prices high enough to ensure member access to quality providers. Reference providing is not a substitute for effective provider contracting and credentialing. For reference pricing to succeed, payers need to ensure that patients have adequate access to in-network providers participating in the reference price program. Adequate access provides patients with choices between providers based on quality of care. If a member chooses a non-participating provider (i.e., one that does not participate in the reference pricing program), the member is likely to be subject to balance billing without any protection from the out-of-pocket limits specified in the ACA. Adequate access is especially important for lower-income members who do not have the resources to afford providers who set their prices above the reference price or to travel to providers who accept the reference price. For a reference pricing system to work effectively, patients need the time and resources to do their research and make informed choices. Patients must be provided with meaningful and transparent information about provider quality, pricing, treatment alternatives and expected outcomes from each alternative. Without sufficient information, patients may choose less-than-optimal treatment alternatives. Why Might Reference Pricing become more Prevalent? Jennifer M. Polinski, ScD, MPH; and Niteesh K. Choudhry, MD, PhD; American Journal of Managed Care; pp. 429-437). Given that the cost of healthcare in the US is projected to rise at a rate of more than 4% per year (Source: http://www.healthsystemtracker.org/chart-collection/the-latest-health-spending-projections/; accessed November 11, 2015) and consumes 1/6 or more of our gross domestic product, techniqu es that reduce the cost of care are attractive. Presidential candidates are suggesting that governmental price controls on drug prices are required. Reference pricing programs might offer an alternative to those regulations. Reference pricing offers the potential to reduce the wide variation in prices between providers that currently exists. Consistent, lower pricing could encourage the differentiation between hospitals to focus on quality of care and improved outcomes. What is Reference Pricing Proceeding Slowly? Health plans are moving slowly with reference pricing as the outcomes of the program are uncertain. Reference pricing does not guarantee cost savings. Utilization of healthcare products and services might increase as they become more affordable. Lowering the cost of care might limit innovation. Providers and manufacturers will earn less of a return on their investments in new products and services. Manufacturers might opt to design products without the advanced features that enhance the quality of care to maximize profitability. Providers might hesitate to invests in centers of excellence. These reactions could affect the quality of care, which might increase the cost of care in the long term. Health plans need to negotiate adjustment factors with providers treating higher-acuity patients, such as academic medical centers. One price does not fit all. The limits that Obamacare sets on annual out-of-pocket costs of $6,600 for an individual and $13,200 for family coverage in 2015 do not apply to charges above reference prices. This allows health plans to increase member cost-sharing, which may increase their incentive to adhere to reference based pricing. However, for patients without access to hospitals participating in the reference pricing program, the increased financial responsibility may limit their desire and ability to seek care. Without care, their health status may decline, costing the healthcare system more in the long term. In contrast, one could argue that excluding member contributions in excess of reference pricing is the same treatment as applied to provider balance billing. Consistent treatment is warranted. Also, for patients with limited access to providers participating in the reference pricing program, healthcare spending might increase without any commensurate increase in healthcare quality. What, then, would the reference pricing program achieve? Drug and device companies as well as other healthcare manufacturers should monitor the growth in reference pricing programs. While there is significant interest, there also is substantial uncertainty as to its impact on cost and quality of care. If reference pricing takes hold, manufacturers should determine if it might be applied to their drug class or the procedures utilizing their diagnostic imaging equipment, medical devices or assays. If so, assess the product design and pricing that will optimize product utilization. Product development flexibility is required as reference prices shift and purchasers react to the new payment mechanism. Entry filed under: benefit design, cost of healthcare, cost reduction, Pricing Study, reference pricing. Tags: benefit design, cost of healthcare, cost reduction, pricing, reference pricing.